Central Pacific Railroad 4-4-0 No. 60 “Jupiter” in original colorful livery. This content requires the base game Train Simulator on Steam in order to play. Now, through the extraordinary craftsmanship of Smokebox, Central Pacific’s 4-4-0 Jupiter comes to life in Train Simulator! 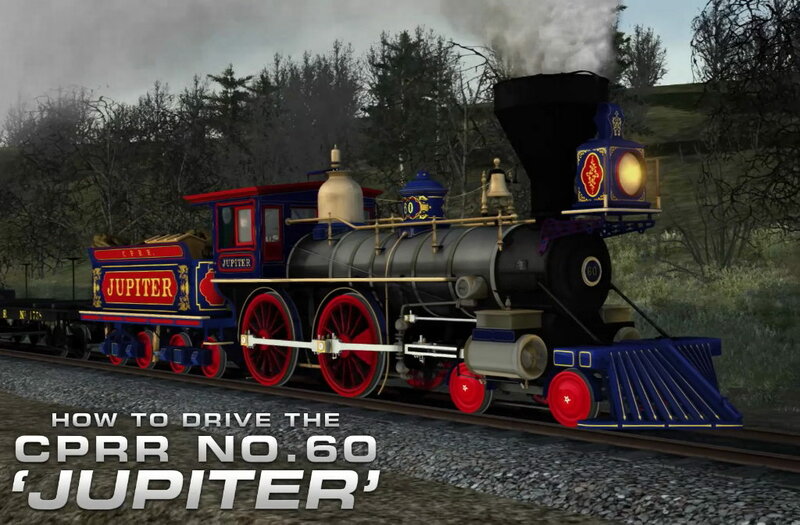 The Central Pacific Jupiter pack includes the historic Jupiter as well as sister locomotives Storm, Whirlwind, and Leviathan; authentic flat cars, baggage car, various styles of Emigrant coaches, and a coach-caboose with detailed passenger views; and a variety of new track and scenery assets designed to allow route builders to create their own 19th century railroad routes! As this engine was built in the 1800's it has no air or steam brakes, instead you must rely on your brakeman (activated via whistle), and using the reverser and throttle to reverse the direction of the wheels.